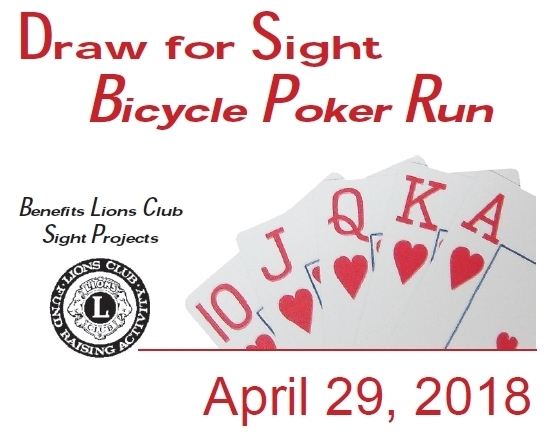 The Chestertown Lions Club welcomes cyclists to Draw For Sight Bicycle Poker Run Ride. The tour consists of a 36 or 60 mile rolling to flat course. The route takes in the scenery of the heartland of Upper Kent County in Maryland including farmlands, old country homes, quaint towns, and great country stores. The ride goes through historic Chestertown. Route starts and ends at Betterton Volunteer Fire Company, 2 Howell Point Road, Betterton, MD 21610. Ride ends promptly at 2:00 pm. All score cards must be turned in by 2:00 pm. Make checks payable to Chestertown Lions Charities, Inc. Proceeds go to Lions Club projects. Click here for a mail-in registration. Walk-in registration will be available on the morning of the ride. To speed up the registration process, print a mail-in registration form and have it completed with payment in-hand at the time of registration.